One-Hour Cheese: Ricotta, Mozzarella, Chèvre, Paneer--Even Burrata. Fresh and Simple Cheeses You Can Make in an Hour or Less! (Paperback) | Fountain Bookstore, Inc.
It’s a DIY cook’s dream come true: It’s pizza night, and you’ve made not only the crust and sauce but the mozzarella, too. Or you're whipping up quesadillas for a snack, using your homemade Triple Pepper Hack. Or the dinner party's in high gear and out comes the cheese plate—and yes, you've made all the cheeses on it. Even better—you made them all earlier that day. 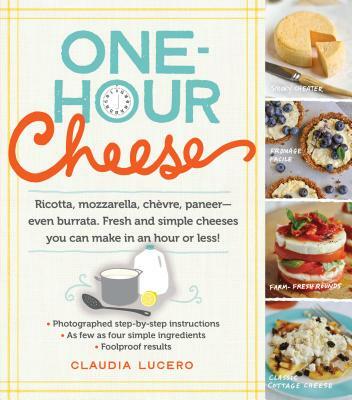 In a cookbook whose results seem like magic but whose recipes and instructions are specific, easy-to-follow, and foolproof, Claudia Lucero shows step by step—with every step photographed—exactly how to make sixteen fresh cheeses at home, using easily available ingredients and tools, in an hour or less. The approach is basic and based on thousands of years of cheesemaking wisdom: Heat milk, add coagulant, drain, salt, and press. Simple variations produce delicious results across three categories—Creamy and Spreadable, Firm and Chewy, and Melty and Gooey. And just as delicious, the author shows the best ways to serve them, recipes included: Squeaky “Pasta” Primavera, Mozzarella Kebab Party, and Curry in a Hurry Lettuce Wraps. Claudia Lucero is the entrepreneur behind UrbanCheesecraft.com and DIY Cheese Kits, which she sells through Etsy, specialty food shops, and select Whole Foods stores. She also developed the home cheesemaking kits for Williams-Sonoma’s Agrarian product line. She lives in Portland, Oregon.